On October 8, 2012, at the age of 91, James “Jimmy” Fitzmorris inspired an assembly of New Orleans area students to embrace success and defy limitations, challenging them to find the positive potential within every situation. Ever devoted to fostering Louisiana excellence and pride, Fitzmorris’ speech earned a standing ovation, culminating an extraordinary decade of practicing what he preaches. From establishing a scholarship fund that supports the education of local youth, to the construction of a performing arts center that nurtures the cultural vitality of our community, Fitzmorris’ actions truly speak volumes to his home state. 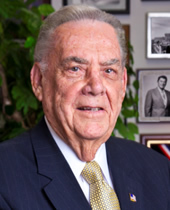 Renowned for his career in Louisiana politics and success in the railroad industry, Fitzmorris cultivated his legendary leadership skills over the course of countless political campaigns and corporate initiatives. He’s also celebrated for negotiating the acquisition of land for the Superdome, a source of pride for Louisiana and Saints fans everywhere. Through years of experience, Fitzmorris has perfected the art of bringing people of diverse backgrounds and often conflicting objectives together and striking deals where everyone wins. Experience has taught Fitzmorris that only a solid foundation of democracy and cultural excellence can enable our future artists, business leaders and politicians to achieve great things. He believes the single most important investment we can make to our future is the education of our youth. Recognizing the vital role of arts and local culture to our economy, Fitzmorris tirelessly champions their prominent role as essential components of education. James Fitzmorris … Peoples Health Champion.